Setting therapy session fees is a critical part of private practice business management, since it can influence both your potential clientele and take-home income. Your fee range might depend on external factors (cost of living and rent prices), what services you offer (years of experience, levels of specialized training, time spent in and out of session), and your level of brand awareness (marketing, positioning, and personal networks). In addition, an important factor to consider is what other therapists charge in your city – this gives you a benchmark of what your colleagues charge for comparable services, as well as what localized prospective clients understand to be the average cost of therapy. 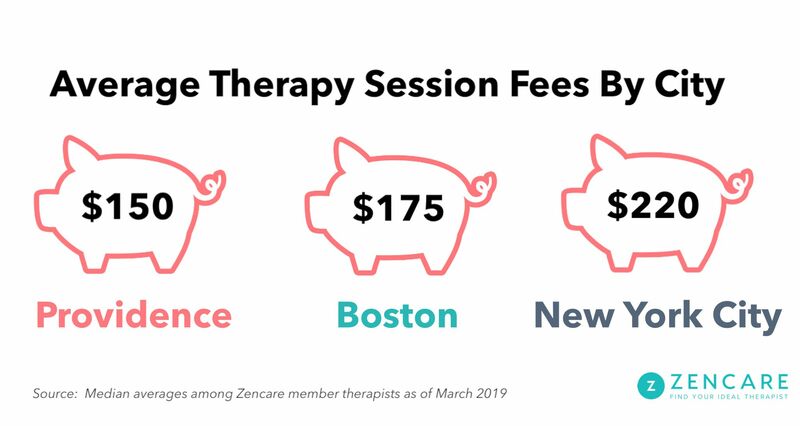 To find out how much therapists charge in each city, we analyzed average session fees across three cities (New York City, Boston, and Providence) and provider license types, as well as the frequency of range of sliding scale rates. Read on to find out how much therapists charge in your city! Therapy session fees vary by city, and (unsurprisingly) reflect the cost of living in each city. While experts generally agree that continuing education, supervision, and training – particularly in niche specialties – are most important in a provider's quality of care, there is a marked difference in costs per session across degree types, and by city. Psychiatrists are generally the highest charging (and highest earning) mental health professional, generally followed by psychologists, social workers, and counselors. As perhaps expected, New York providers charge the most per session: Median session fees in NYC range from $150 (for social workers) to $400 (for psychiatrists). Boston rates are slightly lower at $145 (for mental health counselors) to $325 (for psychiatrists). Providence per-session rates skew the lowest, reflecting the more affordable cost of living and rent in the city, ranging from an average of $125 (for social workers) to $300 (for psychiatrists). With higher living and office costs, therapists in New York City charge higher prices than therapists in most other cities in the U.S. 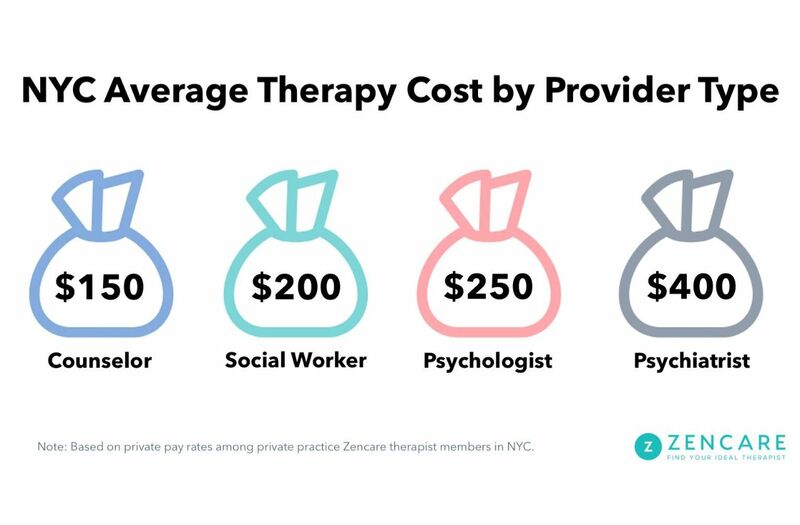 Within NYC, the median session fee varies widely by provider type as well: psychiatrists on average charge $400 per session, while the average for mental health counselors is $150 per session. Related: How much does therapy in NYC cost? As in NYC, Boston rates vary widely across provider types, with psychiatrists charging an average of $300 per session, double the $150 rate of social workers. 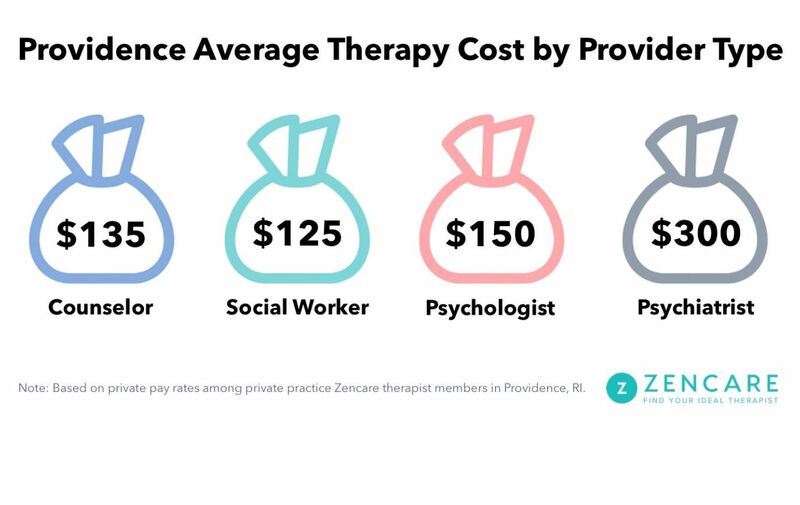 Providence residents are in luck – therapy is more affordable in the Ocean State, and the difference in fees between different types of providers is not as drastic as in the other two cities we examined. 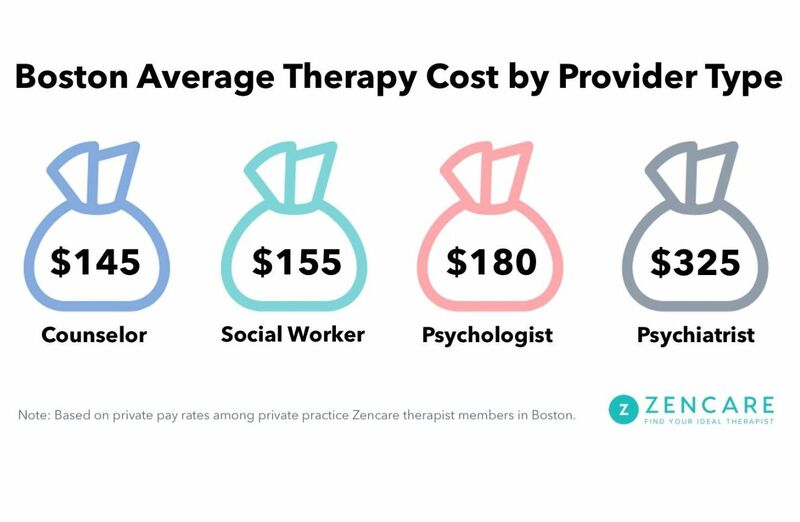 While psychiatrists do charge markedly more ($300 per session on average), average fees among counselors, social workers, and psychologists range from $125 - $150, a relatively small range. Interestingly, sliding scales are offered at a consistent rate across cities: Nearly half of therapists in New York City, Boston, and Providence offer sliding scale fees. It's important to note, however, that the sliding scale in each city is reflective of its overall average regional cost per session. A sliding scale in NYC, for example, might refer to $175 - $225 per session, while in Providence it's more common to see sliding scales ranging between $100 and $150 per session. Related: All set on set fees, but figuring out how to better manage billing and session notes? Learn about the most popular therapist billing and practice management tools and how to choose the right platform for you. The starkest contrast in session fees is the percentage of private pay only vs. in-network therapists by city. While 80% of therapists in Providence are in-network with at least one health insurance, only 20% of NYC therapists take any insurance. 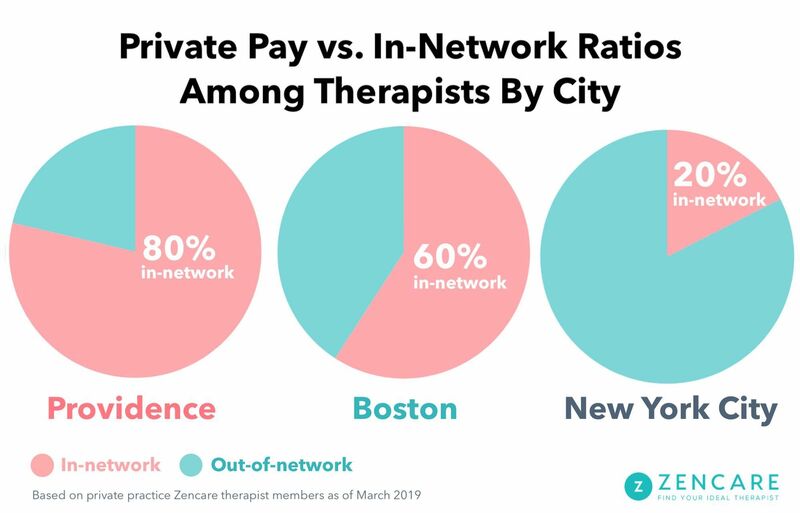 Boston therapists, meanwhile, are almost half and half, with 40% of therapists in-network with at least one insurance. *Note: In-network here below implies the therapist is in-network with at least one health insurance company. Percentages have been rounded. Related: Questioning whether to accept health insurance or not? Here's our breakdown of the pros and cons of in-network vs. private pay. Now that you know how much your colleagues charge for therapy sessions in your location, learn how to build up your practice through private practice branding. 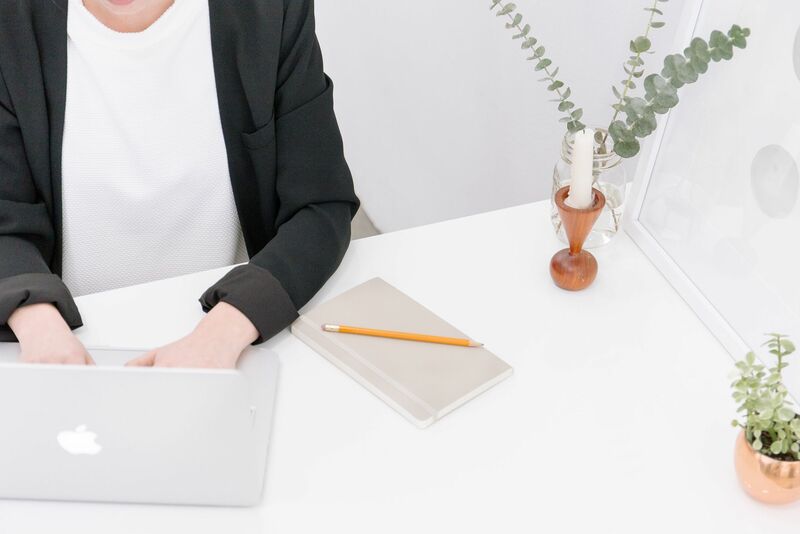 Still not sure how to launch a stellar online presence? Zencare can help. Schedule a free call with our Therapist Success Team to learn more! The findings presented in this article are based on an analysis of 508 private practice therapists in the Zencare network (272 NYC therapists, 93 Boston therapists, and 143 Providence therapists). Median is used throughout to account for a non-normal distribution of session fees. Disclaimer: Since our findings solely reflect the rates of Zencare providers – all of whom have been vetted to ensure excellent training – the figures might be skewed toward upper market prices.